Zumub Vitamin E Softgels feature one of the most potent antioxidants and one of the key nutrients to support overall well-being. – Vitamin E. Although you can get Vitamin E through such foods as sunflower seeds, almonds, hazelnuts, mango, and a number of other plants, it’s not always possible and easy to consume proper amounts. 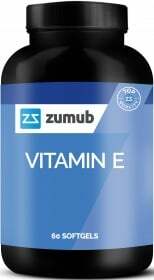 Zumub Vitamin E is a safe supplement aimed to replace natural sources in the best and purer possible way, we only added a few ingredients to form the shell and they are absolutely safe. We cared so much because we know the importance of antioxidant protection Vitamin E offers. Its ability to reduce oxidative stress is one of its main charactristics. Just make a few quick clicks to order Zumub Vitamin E Softgels - the rest is our job. Have a question about Vitamin E? What is it, what does it do, how and when to use or something else? Ask us. May contain allergens handled in the production facility: cereals containing gluten, soybeans, milk, lactose and nuts. As a supplement, take 1 softgel a day, or as suggested by a healthcare professional. WARNINGS Vitamin E : Do not exceed recommended dosage. Keep out of reach of children. This product should not be used as a substitute for a varied and balanced diet & healthy lifestyle. This product should not be used in case of hypersensitivity or allergy to any of its constituents. Store in a cool, dry place. Please Recycle. BEST BEFORE: Please see lot number and expiration date stamped on the packaging.